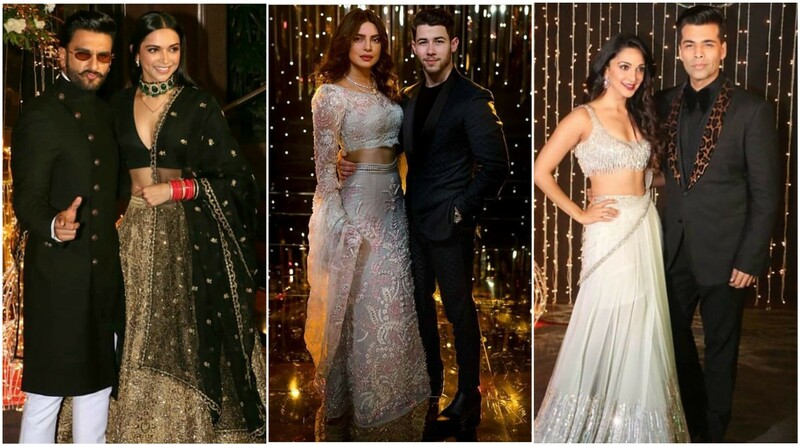 The celebrity couple Priyanka Chopra and Nick Jonas, who tied the knot earlier this month in Umaid Bhawan, Jodhpur, threw a party for the Hindi film fraternity on 20 December. A slew of celebrities turned up for the bash and dazzled at the wedding reception of the couple. For the reception, Priyanka wore Abu Jani and Sandeep Khosla’s light blue lehenga with heavy embroidery detailing. And to complete her look she teamed it up with matching chains and styled her hair in beachy waves. Nick opted for a black T-Shirt and royal blue blazer suit and he looked dapper. The power couple of Bollywood, Ranveer Singh and Deepika Padukone, were seen twining in gold-and-black attire. It’s needless to say that they totally stole the limelight. Anushka Sharma arrived draped in a seafoam coloured, stunning sheer saree. The gorgeous Katrina Kaif, who wore a beige saree in an unconventional way, added a cape to it. Aditi Rao Hydari kept it simple and wore a black embroidered lehenga with golden jhumkas. Kangana Ranaut, too, wore a silk saree with a huge low bun. Newlywed Saina Nehwal and Parupalli Kashyap graced the event. The badminton player was spotted slaying in a stunning golden lehenga. Yami Gautam chose to wear a blush-coloured lehenga with frills added to the dupatta for the event.